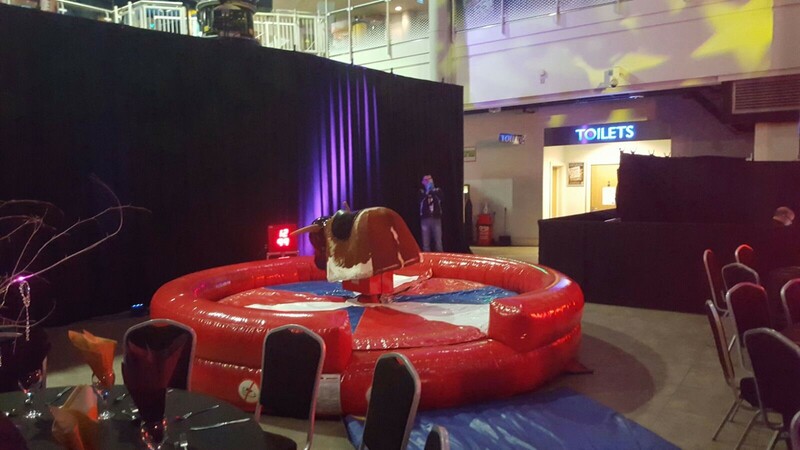 Our Rodeo Bull or better know as a Bucking Bronco Simulator is designed to give you a very realistic feel as to what it would be like to ride a real rodeo bull. 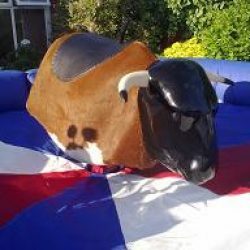 This bull is designed for juniors and adults, and provides a taste of the real wild west. 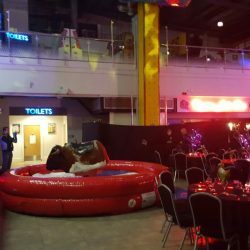 It will be sure to give you, your friends and family, a great deal of fun and entertainment. 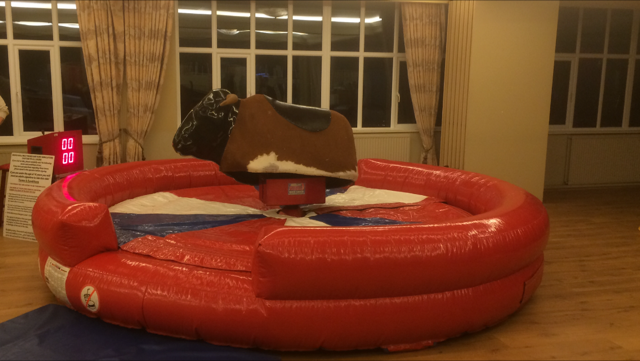 With a built in timer clock this enables you to have competitions to see who can ride The Bull the longest! 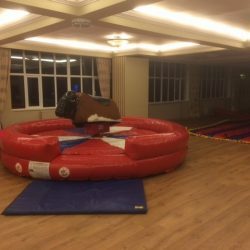 Ideal for barn dances, Hoedowns ,country & western nights, wild west themed parties, pubs & clubs, for both indoor and outdoor events such as corporate, private garden parties, weddings, birthdays, fantastic fun for hen and stag parties. You name it and we can cover it. 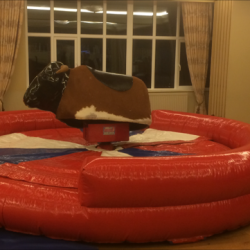 Our Rodeo Bulls are always supplied with a fully trained experienced ride controller who will ensure the safe operation of the Bull for all riders. 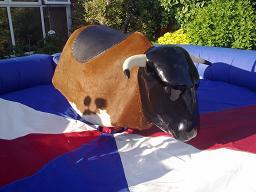 The Bull is annually safety checked by the manufacturers and is also P.A.T. 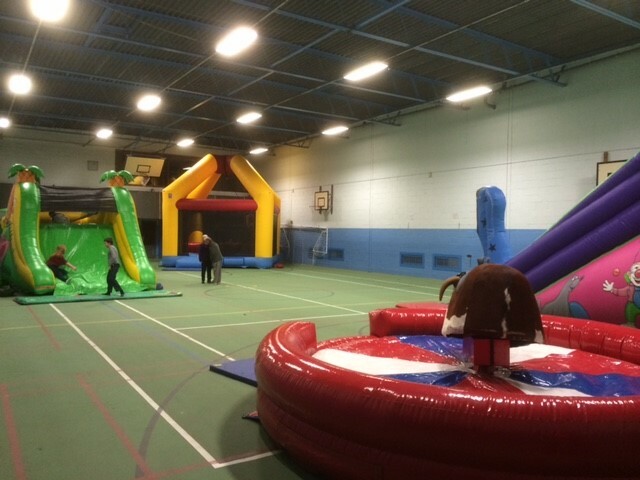 electrically tested and covered by £5m public liability. 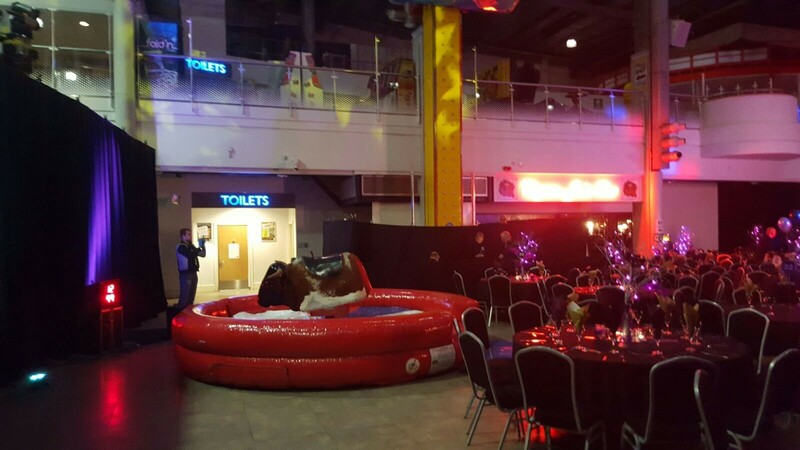 To ride our Rodeo Bull riders must be over 1.2M tall and able to mount the Bull by themselves. 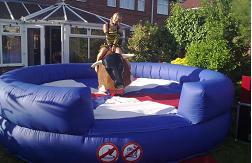 Ride em” cowboy, We guarantee to give you, your friends, colleagues or family, a great deal of fun filled entertainment. 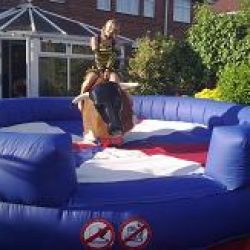 We can provide a standard round red white and blue inflatable bed that is 15x15ft or we have a fantastic looking wild west themed inflatable with an inflatable cactus and picket fence around it. 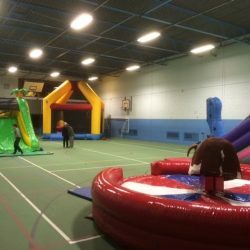 For all indoor hires you will require a minimum ceiling height of 9ft and a floor space of 18x18ft square to set up in. 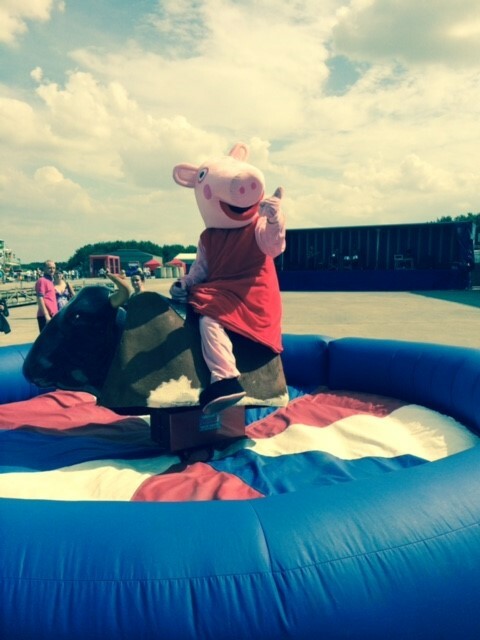 Our Rodeos also come with flashing red eyes for added effect. 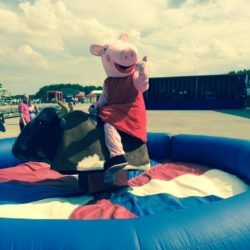 Additional hours are available and are charge at an hourly rate. 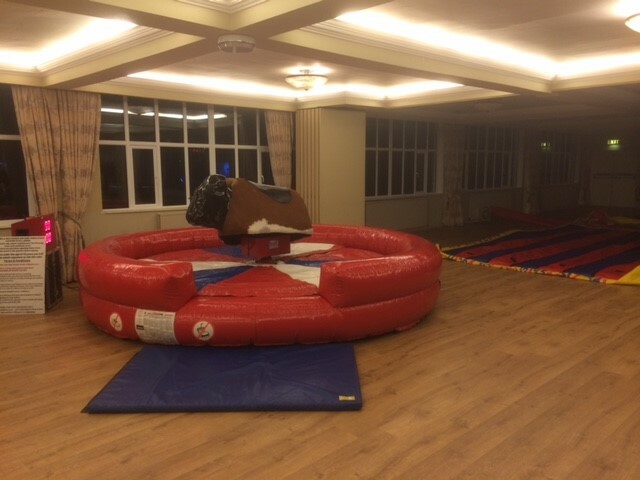 Feel free to call or email us for a quotation. 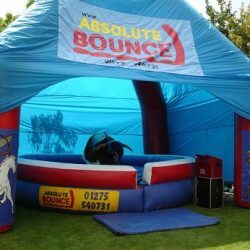 Please do take the time to have a look at our other fantastic inflatables on our website. 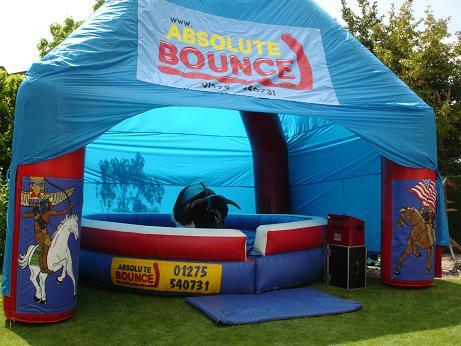 Do Remember that not all inflatable company’s offer the same great service and value that we offer to our clients. 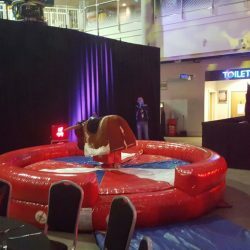 We can offer discounts when hiring multiple items.